Alice is from a poor family. One day she comes home from school to be told that her parents can no longer afford to educate her. Her mother tries to send her to her grandmother’s house but Alice is adamant that she wants to stay at home. Eventually Alice is persuaded to go to her uncle and his wife’s house as a house girl. They tell her mother that they will send her to school in the city, of course this falls apart pretty quickly as her uncle’s wife has her own plans for Alice. The opening of the movie is dramatic. 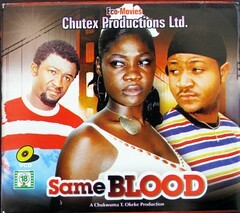 We see Alice, played by Mercy Johnson running out of a compound with Collins played by Muna Obiekwe running after her. She is knocked down by a passing car and the driver Ade, played by Benedict Johnson takes her to the hospital for treatment. From here the story just gets more and more confusing. The story goes from present day into the reverse to give us the background as to how Alice ended up in Collins’ house. The only problem is you never find out exactly what the deal is with Alice, Collins or Ade. The whole story seems pointless and by the end of part one I was pretty disappointed that I did not have much of a clue as to what was going on. The film drags on and is boring. As I fell in and out of sleep so many of the scenes seemed to repeat themselves in different variations. It was soooo slow and sluggish and only the vibrancy of the Mercy, Muna and Cassandra’s performaces caught my attentions every now and then. The whole situation with Alice’s uncle’s wife was confusing. She wanted her to become a prostitute and Alice did not want to so was the guy stopping Alice on the street and claiming to know her a set up or not? The aunt then tells her husband that she wants to “send her to a shop to work.” She sends her to meet a guy under false pretences and when Alice realises what she is there for she runs way. What was the point? The end of part 2 brings us full cycle. We see Alice fleeing to Collins’ house to escape her dreaded aunt and uncle. That brings me to the question, so why then in the beginning is she running from Collins’ house. What has Ade the guy that found her have to do with the whole situation? Where does he fit in? In short this film is a complete and utter waste of time. This isn’t the sort of junk actors like Mercy, Muna and Cassandra should be wasting their talent in. It was nonsensical and boring. Its so dissapointing to see good actors like Muna and Mercy in movies like this… I dont think Genevieve would be caught dead in this movie..